At Istanbul Blue Restaurant, you will instantly feel as though you walked into the city of Istanbul. We offer a variety of Mediterranean and Turkish dishes, all served within a comfortable, warm setting. 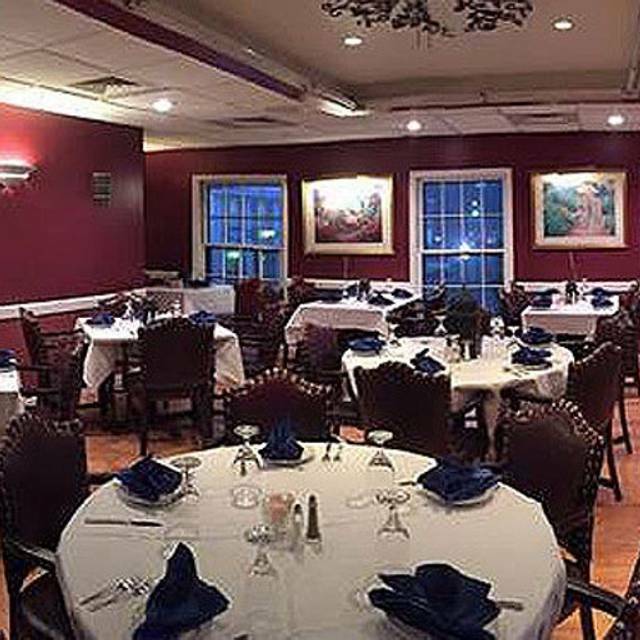 The restaurant provides generous portions, while maintaining modest prices. Our specialty is authentic Turkish cuisine. Each dish is prepared with fresh ingredients and is hand made with care. When you are looking for something different yet delicious come visit Istanbul Blue Restaurant! Our specialty is authentic Turkish cuisine. Each dish is prepared with fresh ingredients and is hand made with care. When you are looking for something different yet delicious come visit Istanbul Blue Restaurant! Served with spices & rice or mixed vegetables. Wonderful restaurant. Authentic and not cookie cutter. Relaxed atmosphere and great food. Loved this restaurant and plan to return soon! It’s authentic, delicious food and has excellent service. A gem! I have always enjoyed Istanbul blue and I go there all the time. But this time I was not too satisfied with the service. They didn’t serve the complimentary soup which they always did before. And the food served was a little cold. Food was great! Waiter was a little rude. He could be more friendly for a party of 8. First time my husband and I chose that restaurant. The food was excellent and I will certainly comeback for special occasions. Food and service were very good and we intend to go back very soon. The food was very good here but the service was lacking. The waiter forgot my wine, and never came back after serving our entrees. I had to flag him down for a water refill because he never checked in with us, and he never brought that. I love Turkey and its cuisine, and often visit Turkish restaurants in the area, though usually closer in to the city. It was a surprise to find one further out, and that was of this quality. Excellent food, Turkish tea, service, and a quiet atmosphere. I’ll certainly be back. Excellent food and service. Very pleased. Fun night with friends food was hearty and we enjoyed wine and cocktails. They kindly adjusted our reservation time too! Istanbul is reliably very good in terms of range of choices, quality of the food, and service. Somewhat hidden in a suburban shopping center, it is easy to overlook, but that would be a mistake. If you are a fan of authentic Turkish cuisine, this is a restaurant you shouldn't miss! Great food and atmosphere. The best restaurant experience ever. Chef "Bob" was SUPERB. Would recommend to anyone. Lovely little spot. Excellent food , and nice service. It was very cold and I was seated by the door for some reason even though the restaurant was pretty empty. I asked to change tables and they did right away. Free cup of homemade soup warmed me right up. 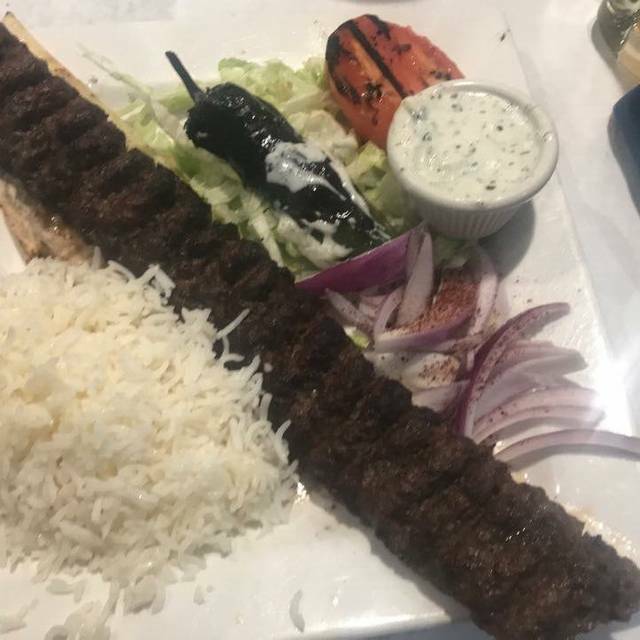 Delicious kabobs! I will go there again for sure . The food and service were excellent! The waiter helped us pick authentic appetizers and main courses as this was our first time eating Turkish food. The desserts were also very good! Will definitely come here again! Excellent service by humble servers and very good food with reasonable prices. Very good and tessty food , courteous and humble waiters and staff to provide good service. Food is great and tasty. Ambiance is very comfortable. Overall great place to dine. Wonderful entrees, fast efficient service, great decor salads, kebobs, soup all great choices. Need another occasion to sample more of the menu! Not special or good enough to make it worth your while to search it out. Been here dozens of times. First fair experience after many excellent ones. This restaurant was very disappointing. While the staff were very friendly and well trained, they were the high point. I would suggest some ambience be added reflective of Turkey , not just the couple of photos on the wall. The food was just ok, nothing special. And it was definitely not a bargain. First time here tonight. 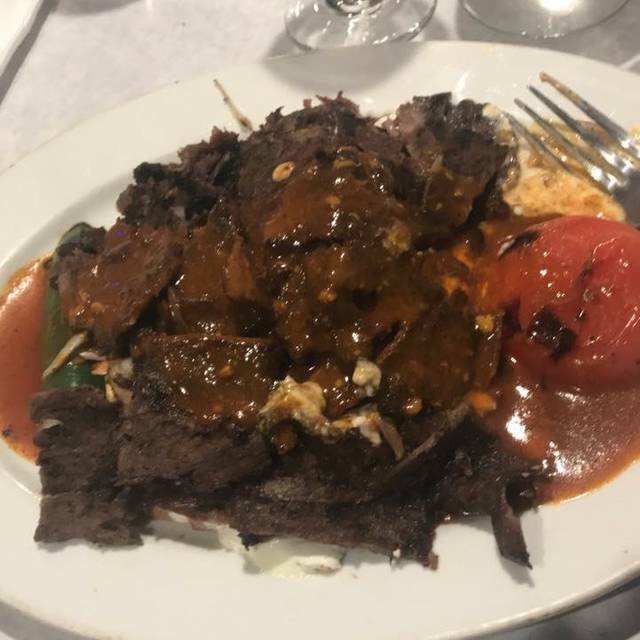 We have been looking for good Turkish food in Vienna, VA and we found the place. The environment was warm and friendly, service was excellent and the food itself outstanding. I highly recommend checking it out and we especially enjoyed the doner kabab and excellent appetizers. Great authentic Turkish food. We came for lunch and it took a while for our main entrees. There where four of us so I would say its best to go for a date or smaller group if you are in rush. Otherwise, the food and service was great. This was an disappointment. I would not recommend this restaurant. First time at this restaurant in early October what a great experience! The service was fantastic and the food reminded me of the meals I had during a trip I took to Istanbul a few years ago. I will definitely return and recommend to anyone who wants to try something different. Great value. Excellent service and a very comfortable setting. The menu was varied with great special dishes from the region. Service, ambience and the food was overall outstanding. What a gem. We will return. A very comfortable and relaxed atmosphere, excellent and authentic cuisine, friendly and helpful service. Couldn't ask for more. This is a good neighborhood Turkish restaurant. Wait staff is attentive and friendly. The food was very good and plentiful. It's good for any occasion: fine dining or a family restaurant. The food was great. The waiter did not inform us that the tip was included fo a table of 8 and as a result was overtipped. Very, very good food. Generous portions. We had three appetizers for 2 people (the hummus is excellent, the falafel homemade, and the cigari boret was good but not my favorite) and wound up partially splitting an entrée (the excellent Adana kebob) because I wanted to try to kunefe (a warm dessert made of what I will translate as shredded wheat with a slightly melted stringcheese filling and covered with a sweet rosewater syrup). All portions were generous. Our only problem was that we didn't get soup...when we noticed it on the menu (after seeing others get served), we asked, and the soup was quickly produced, and was excellent (red lentil soup with mint). 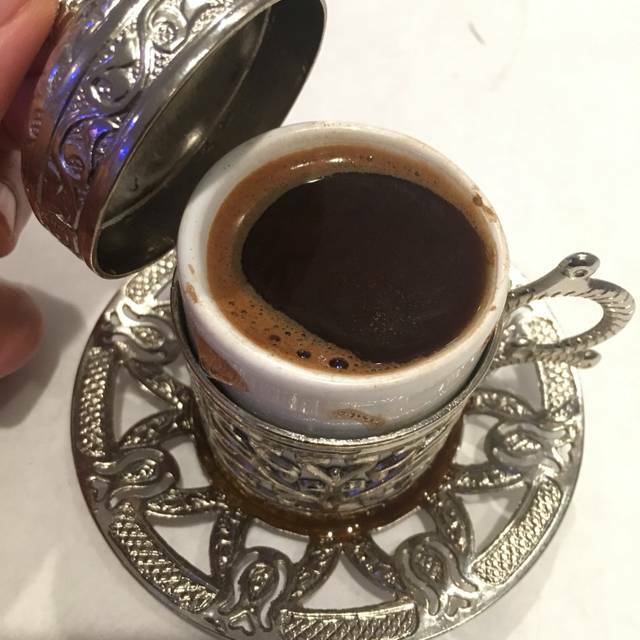 Turkish coffee was made fresh and the presentation (the cup it came in) was great. Turkish tea was good (I was hoping for mint in it but didn't ask...it was still good and came with the required sugar cubes even though there was sugar on the table). We found this looking for a place to eat at on the way to Wolftrap and we will return, even though it's out of our way. Great food and good service. What a neighborhood gem! The chicken dishes are cooked perfectly---moist and juicy. The red lentil soup is flavorful and delishous. We can't wait to go back to try some other dishes. The food and service was excellent. We had the appetizer sample and it did not disappoint. 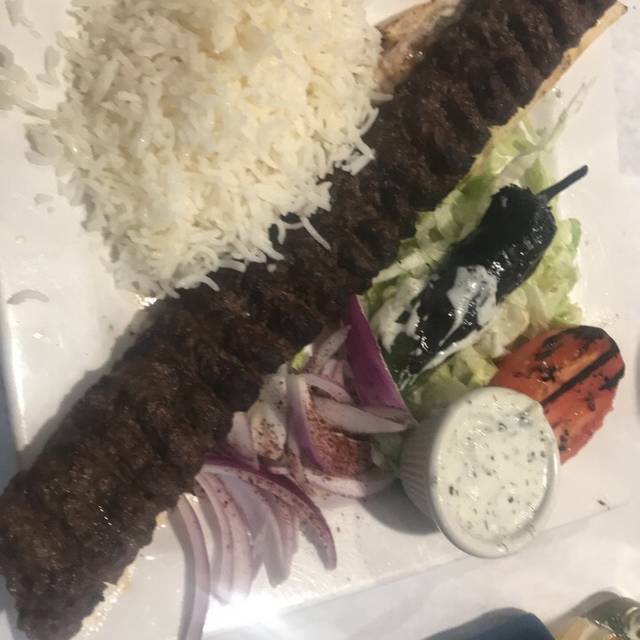 I also ordered the chicken kebab for my main entree and it was very tasty. This definitely worked its way into our family's rotation. The food was very good and servings substantial. Everything seems very fresh and flavorful. Turkish coffee was excellent. Didn't have a bad dish.